The song describes a conversation between a father and son, so there aren't really verses or choruses, there's the father speaking, than the son. If you can sing, you'll be singing the son’s parts more powerfully, and an octave above the father’s, which makes the son’s parts more dynamic, but the father's wiser, so to say. Father and Son is played in the key of G. It is mostly straight forward, except for a few bars which have 5/4 and 3/4 time signatures. It's a bit confusing to describe, but watch the lesson, than practice the song along with the original, and you'll hear how they work. We’ll start our guitar lesson of Father and Son by learning to play the intro. It is based around the G chord, and involves hammering while strumming. This intro lick returns several times in the song. Most of my guitar students aren’t used to doing hammer-ons while playing chords, so this will provide great practice. Next, we’ll learn to play the strumming pattern to Father and Son, which repeats throughout the entire song. Afterwards, we’ll learn the father’s part to the song, followed by the son’s part. They are very similar, except that the son’s sections need to be played more dynamically. The father sings and plays with a softer dynamic, and the son is more powerful, and full of youthful energy, if you will. You can strum louder, and add a few chord embellishments. For example, you can add the high G note to the C, Am7, and D chords while playing the son’s part. 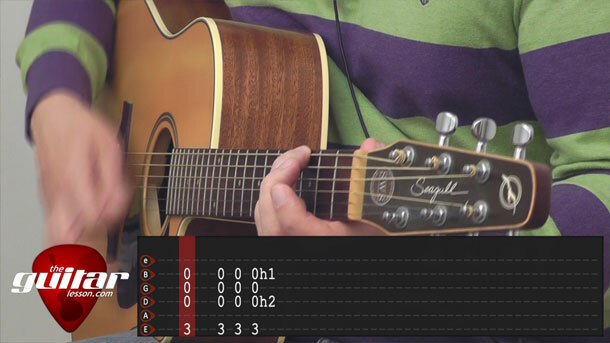 Also, you can mix up your strumming pattern a bit, making it more dynamic. At the end of both the father’s and son’s sections, you’ll have a few bars where the rhythm will feel off. That’s because there, Cat Stevens changed the timing of the song from the usual 4/4. For the father’s section, he changes the last bar to 5/4 time. For the son’s he totally mixes things up dor the last 2 bars, and uses 3/4 time in the last bar. I’ll go into detail about this during the video lesson to Father and Son, and you’ll find the exact strumming patterns in the tablature as well. Towards the end of the video, I will demonstrate the solo. I won't be teaching it note for note, since this is a good listening exercise, but you can download the tablature file, where I include the tabs to the solo of Father and Son. It is pretty easy, there is just 1 thing I want to mention, it starts off with 2 natural harmonics. Learn it, play it, and mind the rhythm. I really love this song both musically, and for what it says. If you are a father to a boy, I really think it will resonate with you as well, as it perfectly captures the impulses of older and younger generations. Father and Son was recorded by Cat Stevens in 1970 on his album titled Tea for the Tillerman. The song was written as part of a musical project, which was never completed. However, the song took off on it’s own. This is arguably Cat Stevens’ most popular hit and has been covered by artists such as Ronan Keating, Rod Stewart, Johnny Cash, etc. Sorry, but you've reached a premium content area. The download of the Father and Son tablature file is only available to premium members. Sorry, the same goes for the backing track. To download the backing track to Father and Son, please log in and revisit this page.